Both Micro Endodontics locations were specifically tailored to provide an inviting, comfortable atmosphere where staff-patient interaction is encouraged. We understand each patient is different and each endodontic experience is as unique as the personalities that define us. You can expect us to do everything within our power to ensure your comfort level is met and your expectations and treatment results exceed your expectations. Micro Endodontics believes personalized care is something everyone deserves and not simply a headline that appears on our literature and website. Micro Endodontics is comprised of a highly skilled group of professionals that utilize a set of core values developed around our philosophy of integrating and utilizing the most advanced technology while remaining genuine in our pursuit of customer service excellence. From the moment you walk in the front doors, whether it be your first visit or if you’re simply stopping by to say “hello”, you are treated with respect, compassion and kindness. Our practices are designed to foster interaction and open conversation, while also providing the level of privacy you would expect from any healthcare facility. Ensuring you are comfortable, relaxed, and confident, from your first consultation through to your last appointment with us, is a commitment we feel every patient deserves. What makes Micro Endodontics truly different, is the quality of the care we provide, as well as the way in which our extraordinary staff chooses to deliver that care. The decor within our practice, the warm, friendly attitude in which each patient is greeted, as well as a soft, soothing and enjoyable environment contribute to the level of comfort we strive to present to each one of our patients. We know you have many choices when choosing an Endodontist—Micro Endodontics is happy to take appointment inquiries online, through our website. We will check availability and respond accordingly. If, for any reason you cannot keep a scheduled appointment, or will be delayed, please call us as soon as possible and we are more than happy to accommodate your busy schedule. 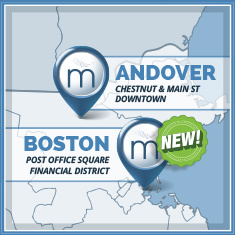 Our contact numbers: Andover Location +1 (978) 475-8008 and our Boston Practice +1 (617) 366-1600. Micro Endodontics is a participating provider with the following dental insurance policies: Delta Dental Premiere and Blue Cross Blue Shield of Massachusetts. If you have an insurance policy with a carrier not listed above, Micro Endodontics will be considered an out-of-network provider. “Out-of-Network,” however, does not mean a patient will have no coverage at all; in fact, most insurance carriers still cover their subscribers if the patient decides to go with a non-participating dentist.